Are you being held back from doing something in your life or work because you are avoiding a potentially difficult conversation because you don’t like conflict? As a recovering people pleaser, I can totally relate! Kwame Christian wants to help you make difficult conversations easier because he believes that the best things in life are often on the other side of those kinds of uncomfortable conversations. 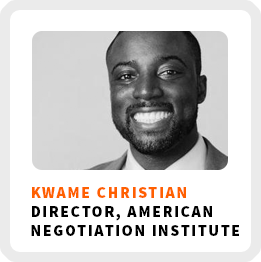 Kwame is the director of the American Negotiation Institute to help people make difficult conversations easier. He also produces the podcast Negotiate Anything, he’s a practicing business lawyer, as well as the author of the newly released book Nobody Will Play With Me. How he pushed himself past being a people pleaser. The internal and external phases of negotiations. The technique of compassionate curiosity and how it helps with difficult conversations. Core work activities + habits: 1) Finishing the book. 2) Creating content for the podcast and through LinkedIn. 3) Connecting with people. Superpower: Learn complex things and making it seem natural. 1) Don’t be passive about promoting it, commit to it and doing it well. 2) Use the recognition and fear of a potential conflict as something to approach rather than avoid. 3) Let yourself be totally vulnerable and really put yourself into creating and promoting the event.